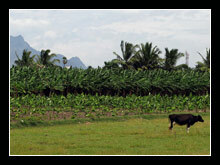 The beautiful paddy field, banana field and the tall coconut tree sceneries provide a refreshing insight into the agricultural activities of Eruvadi. 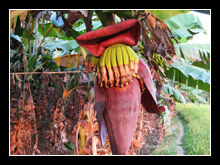 The banan flower. 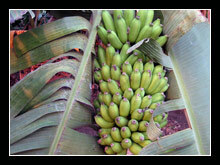 Bananas are in the making. The well where around 10 years before used to take bath "Kallak kulial". 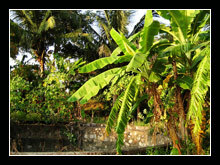 A bunch of banana in one of the banana trees. 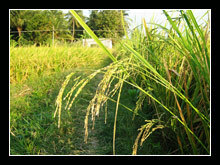 Paddies shining in the sunlight. 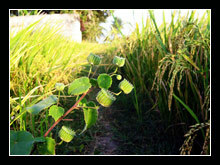 Sunlight reflecting on this small plant in the "varappu". 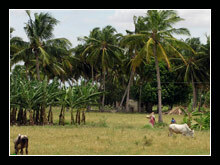 Women working in the fields. 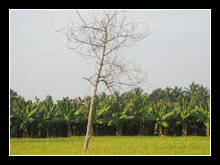 Banna fields fresh and mature. 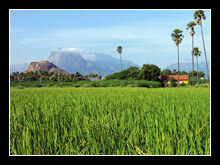 Riped paddy crops with the western ghat at the background.